If I asked you to name the festivals that Edinburgh is known for, I suspect you’d probably tell me all about the comedy-focused Edinburgh Festival Fringe. Which is a pretty great festival, with hundreds of venues popping up all over the city and serving up some of the world’s best comedy and drama, ranging from brand new acts to internationally recognised names. 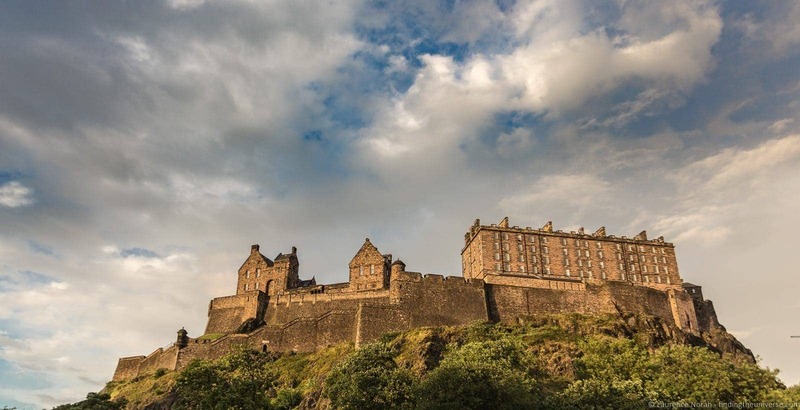 What you might not know is that during August, Edinburgh plays host to no less than five festivals, many of which run in parallel to each other. This is in addition to the six other festivals that run through the course of the year, bringing the total number of festivals that the city’s Festivals team manages to a rather staggering eleven. 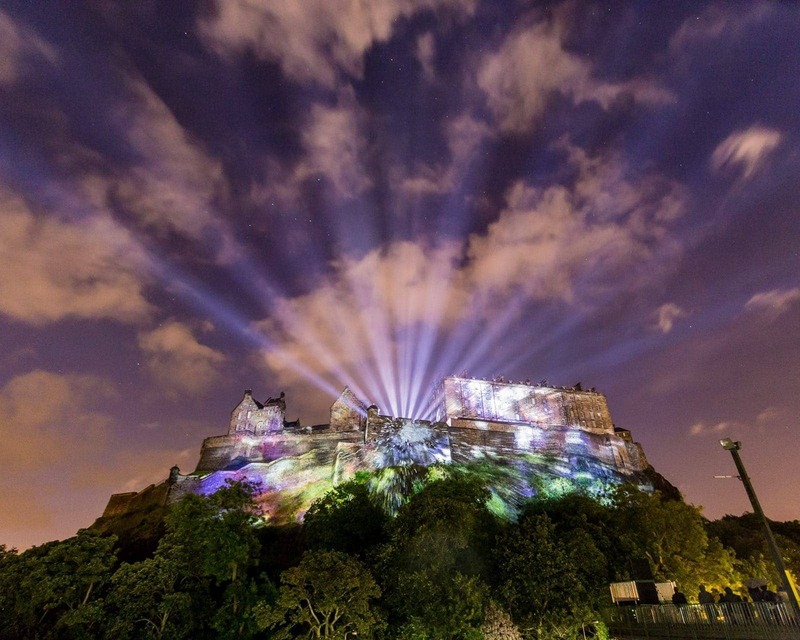 It’s no wonder therefore that Edinburgh bills itself as the Festival City – a title that it is certainly deserving of! As we live in Edinburgh, we’ve been lucky enough to attend all the festivals that the city hold, including the incredible New Year’s Festival that is Hogmanay, and the science themed Edinburgh International Science Festival, which takes places around April. But August is when the city really goes festival mad, with five festivals happening in Edinburgh in August. 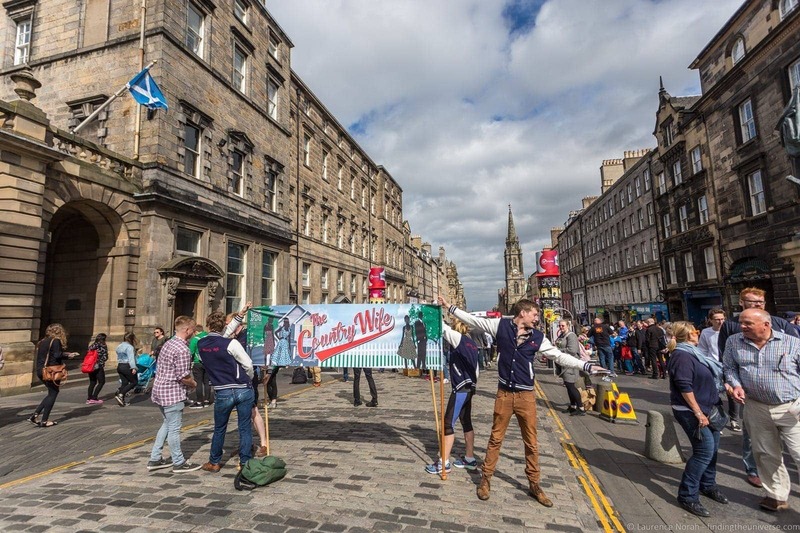 We’ve been to all of them, and wanted to share our experience of all five to give you some tips to plan your own visit to the Edinburgh Festivals in August. It’s even possible (we did it!) to see an event from each of the five different festivals in one day, which is possible if you were looking to really get the most out of your visit to Edinburgh. Jess has written all about that here. For now though, here’s an overview of the August festivals in Edinburgh. 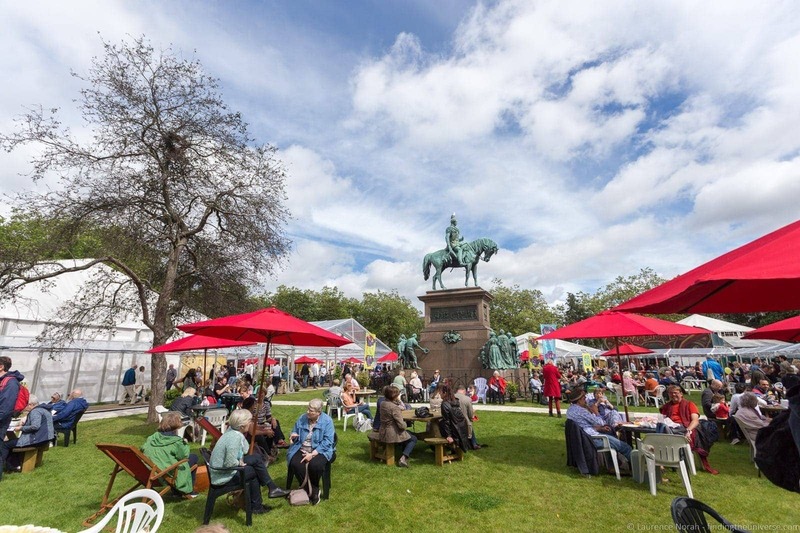 Kicking off the list of Edinburgh’s August festivals, which I’ve ordered based on start date, is the Edinburgh Art Festival, which starts in late July and runs through to the end of August. This is a fantastic festival for art lovers, which showcases all kinds of visual art, with numerous exhibitions covering art that ranges from historical to contemporary, as well as specially commissioned pieces from both new and established Scottish art. Venues range from well established locations through to pop up sites, with the majority of exhibits being free to enter. Essentially, the whole city appears to come alive with art installations. 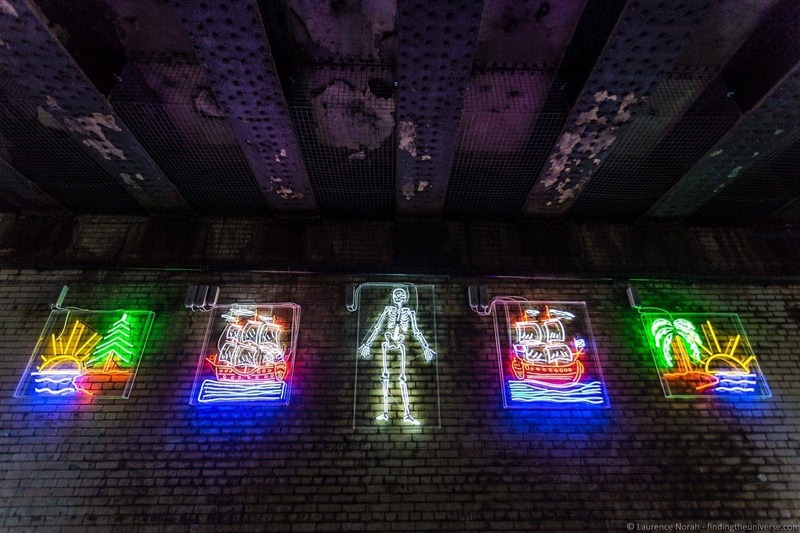 We found art under train bridges, inside monuments and churches, on stairways, and of course, inside some of Edinburgh’s more well known galleries and public spaces. Basically, at some point, even if you’re not trying, you’re likely to come across a piece of art, but we definitely recommend checking out the official website to be sure you don’t miss anything that might particularly interest you. 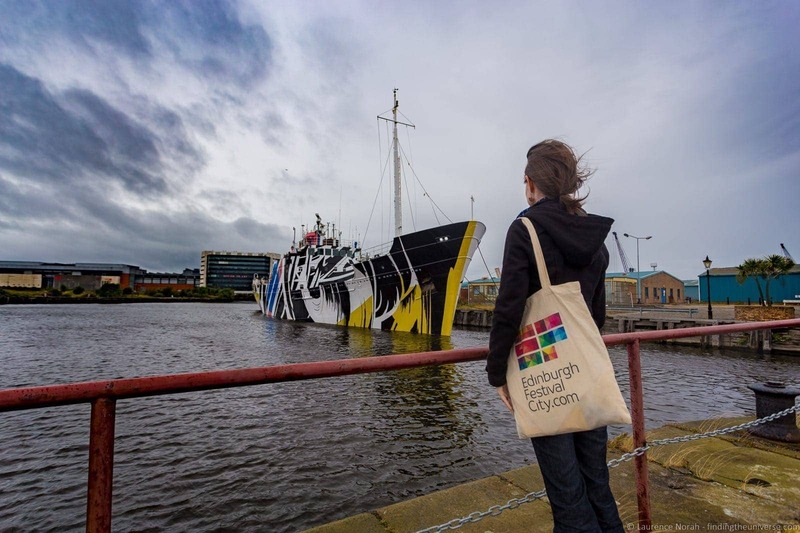 Some of our favourite sights from the art festivals in the past have included the Dazzle Ship at Leith harbour, the “Drama in Time” under Calton Road Bridge, and the “Fountain of Youth” at the Edinburgh Museum. However, we’ve loved so many of the pieces all around the city for the Art Festival, and we’re sure you will too. The Edinburgh International Festival was the first of the Edinburgh festivals. It launched just after the second world war, in 1947, with the aim to provide a platform for the flowering of the human spirit. 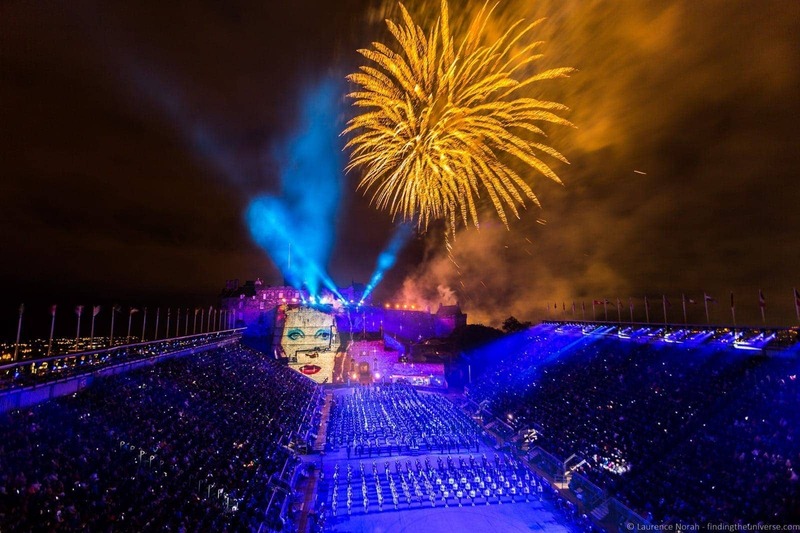 The Edinburgh International Festival is a celebration of the more traditional performing arts, with theatre, opera music and dance shows taking place in six major venues and a number of smaller venues across the city. We’ve attended a number of performances at the EIF. 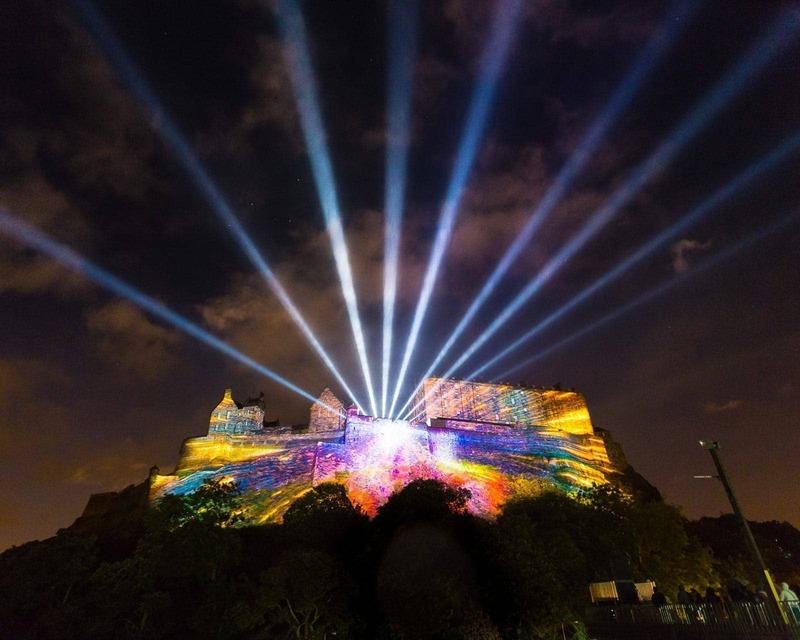 A highlight was the “Deep Time” event in 2017, an incredible sound and light show that was physically projected onto the side of Edinburgh Castle, and which took us on a journey through 350 million years of Edinburgh history. 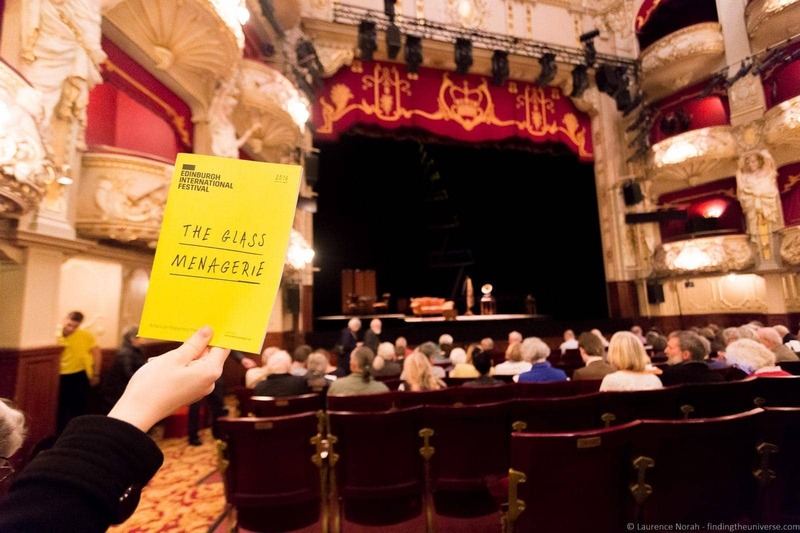 We’ve also attended a theatre performances at some stunning venues, including the critically acclaimed Glass Menagerie, which Jess in particular enjoyed very much. Basically, if you’re looking for world class artistry of the more traditional variety, then the Edinburgh International Festival should definitely be at the top of your list. It runs for the majority of August, and you can purchase tickets for the various shows online. The Edinburgh Festival Fringe, also just known as the “Fringe”, or “Edinburgh Fringe”, is arguably the most famous of all the Edinburgh Festivals. It’s unique in that it’s an open-access festival, which means that basically anyone who wants to put on a show can do so – all you have to do is find a venue willing to host you, and come up with a show to put on! 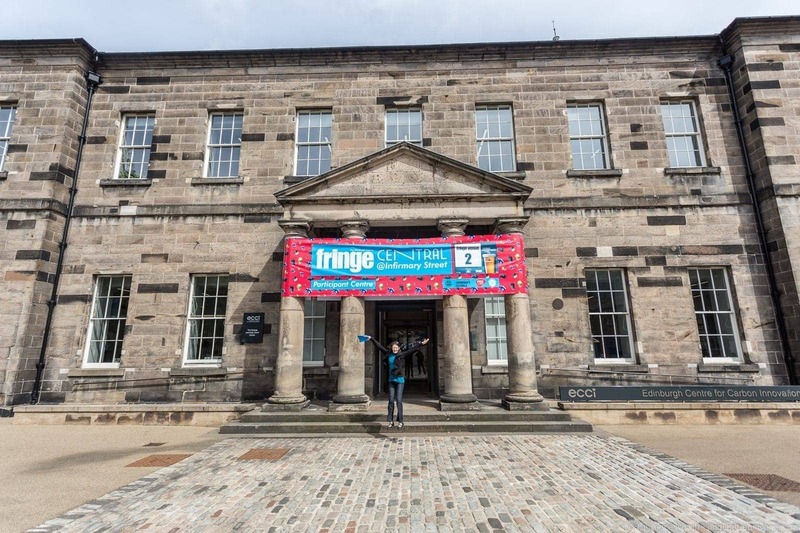 The Fringe started at the same time as the International Festival, in 1947, when a number of uninvited production companies hosted performances at alternative venues throughout the city, in parallel to the official International Festival. The theory was that a lot of people were going to be coming to Edinburgh for the International Festival, so why not capitalise on that? Nowadays the Festival Fringe has grown to a scale that eclipses the other festivals in the city, as well as other festivals of its kind around the world. 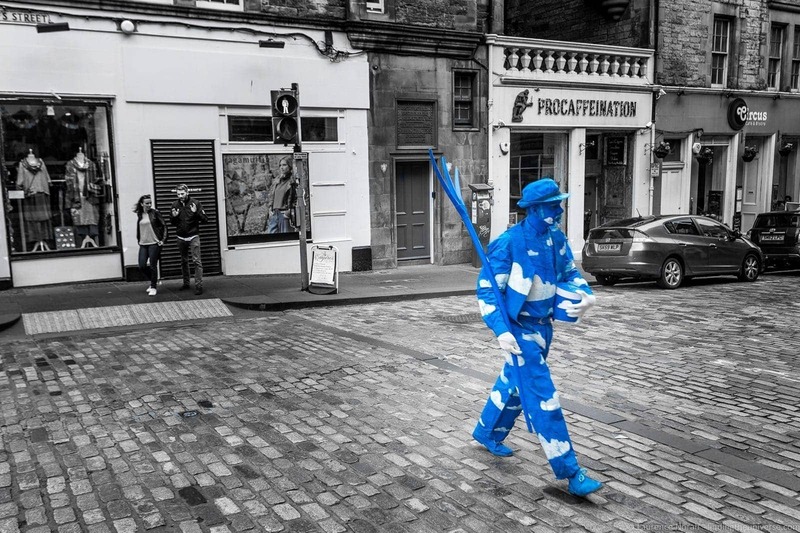 There are literally thousands of shows that take place during the Fringe festival, at hundreds of venues throughout the city, and millions of people come to Edinburgh for the event. Venues range from bars, pubs and clubs, to buses, trucks – and even the back of a motorbike! There are free shows, pay what you want shows, and set price ticketed events, and you can catch everything from performance art to comedy to circus shows. The quality runs the whole gamut from world-class through to, well, you can probably imagine. It’s all part of the experience though – often the best stories from the Fringe are of the worst shows! 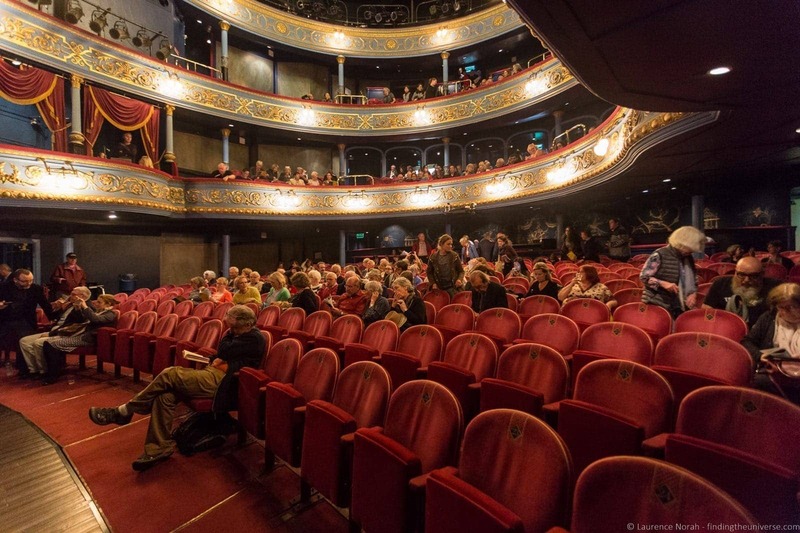 The Edinburgh Festival Fringe is the largest event of its kind in the world, so figuring out which show you want to watch can definitely be a challenge, given the enormity of choice on offer. My advice would be to check the official website, pick up a copy of the official festival programme (also available as a PDF), to keep an eye on social media for what folks are enjoying, and to just roam the Royal Mile. 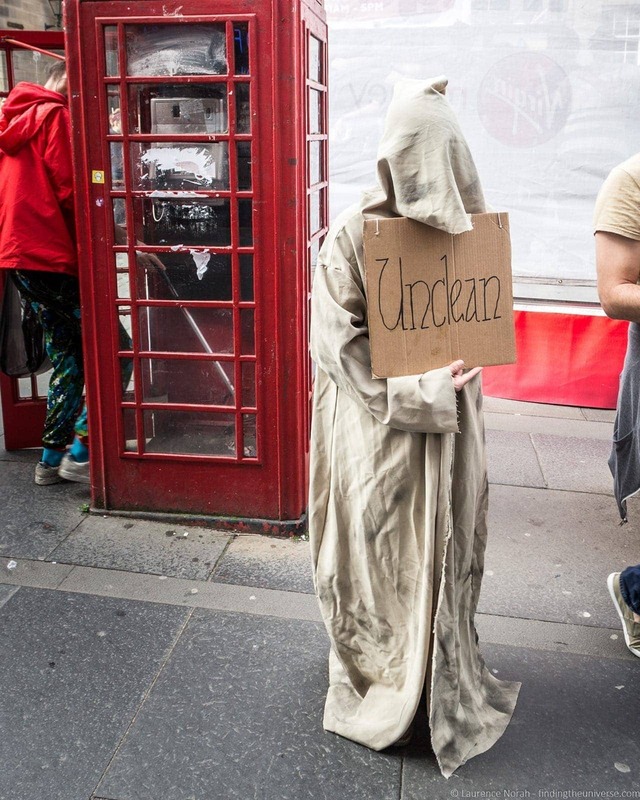 During August Edinburgh is alive with posters and people handing out flyers for their shows, and we attended one of our favourite shows of the festival, a story of a Leprosy Clinic in the southern USA, titled Bend in the River, from a random encounter with the writer on the Royal Mile. We’ve also seen some excellent comedy, had magnificent food at pop up restaurants, and enjoyed a variety of other shows during the Festival Fringe. It’s a festival we look forward to every year! 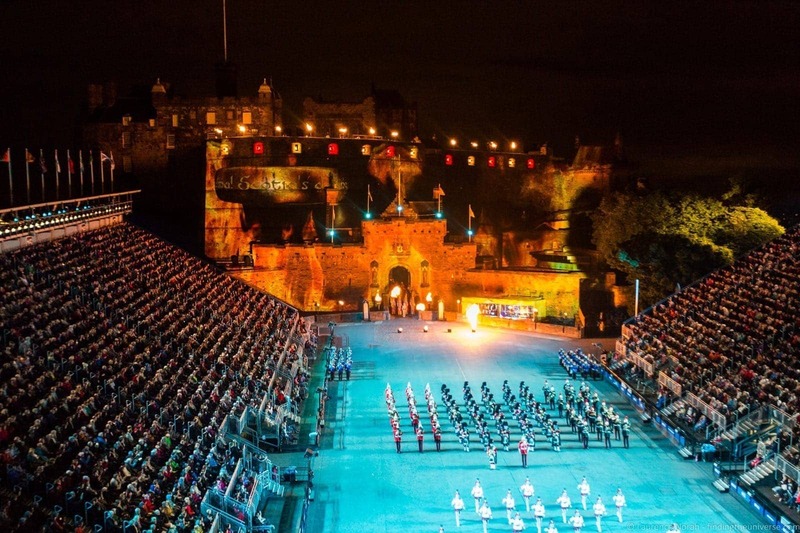 The Royal Edinburgh Military Tattoo has nothing to do with the art of skin painting, and everything to do with showcasing the music, dance and precision of performers from around the world, with a particular focus of course on military bands. This being Scotland, pipes and drummers feature heavily, but there are musical instruments and performances of all types – we’ve seen everything from a youth motorcycle team to a New Zealand pipe band at the Edinburgh Tattoo. 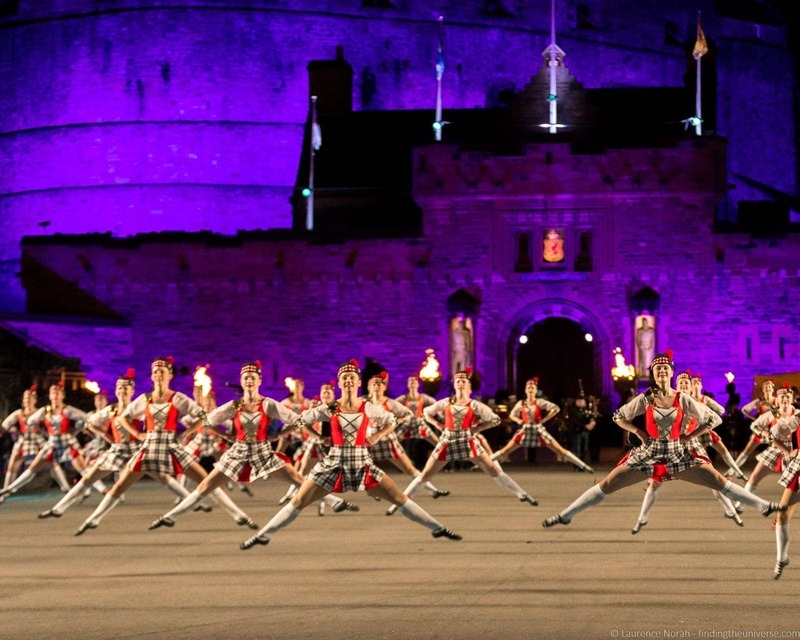 The Tattoo is one of the most watched of all the Edinburgh festivals, with around 100 million people tuning in to watch it on TV. However, nothing beats seeing the spectacle in person, particularly the end of show fireworks. Tickets can be purchased online, or in person in Edinburgh at the box office. There’s a show every night for much of August, but it’s definitely worth purchasing in advance to be sure you get the date that you want as many sell out. We always love watching this show in person. The performances are fantastic, the music is usually a mix of classic and modern, and the ceremony and co-ordination of all the performers is world class. A highlight of course is the Lone Piper playing on the walls of Edinburgh Castle, which makes the hairs on the back of my neck stand up. On one of the years we visited I was also impressed by the New Zealand contribution, which featured a projected dragon and the Lord of the Rings theme music – given that I spent a year traipsing around New Zealand in search of Lord of the Rings filming locations, that was always going to get a thumbs up from me! 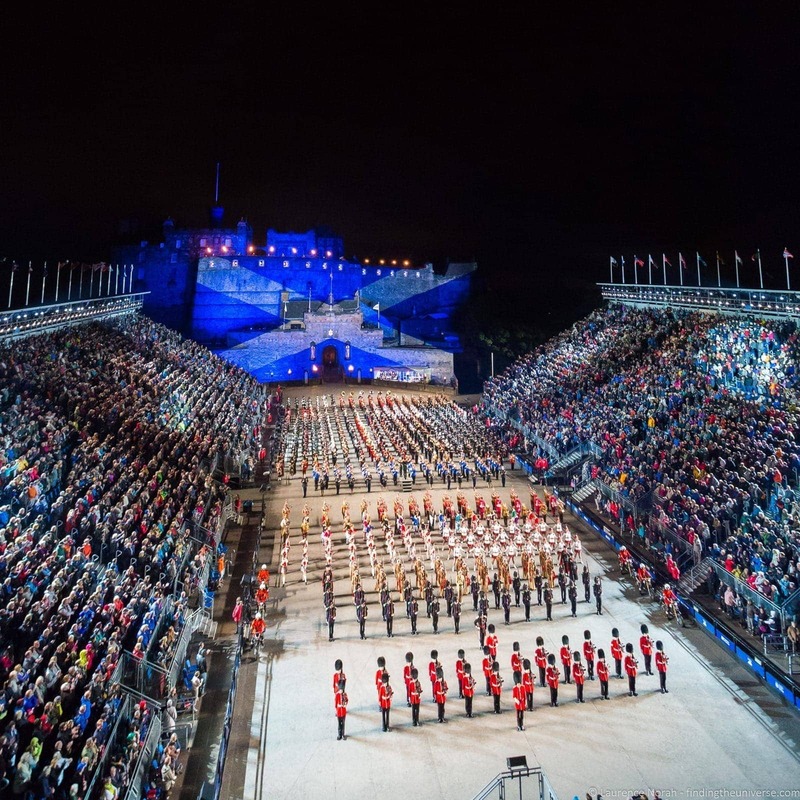 The Tattoo performance usually lasts between 90 minutes and 2 hours, with pre-allocated seating, and has never been cancelled due to the weather. Just make sure you prepare yourself in terms of clothing as it can get a bit cool in the evenings in Edinburgh – even in August (more on the weather in my tips sections below). Otherwise, this is definitely a show you will never forget, and is well worth your time to attend. Time to slow the pace down a bit. All this laughter, music and performance can really tire you out, so why not find a nice quiet spot and take yourself on a literary voyage? 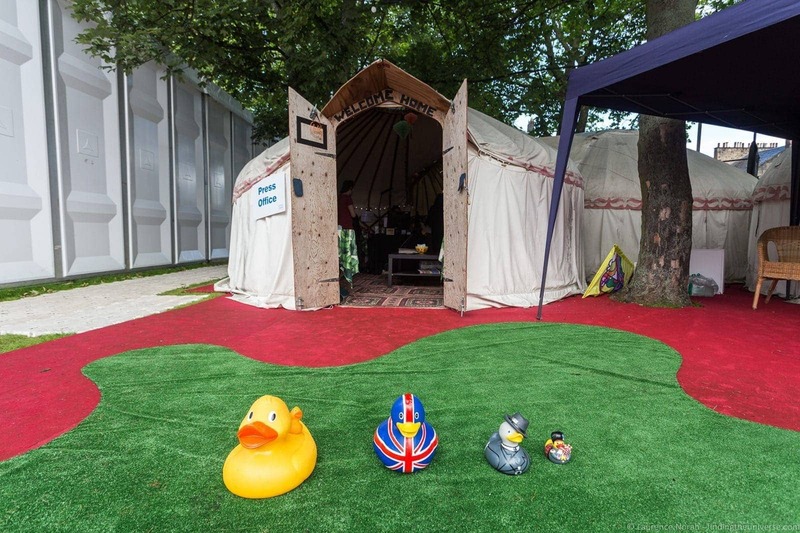 And that’s just the thing you can do at Edinburgh’s International Book Festival. 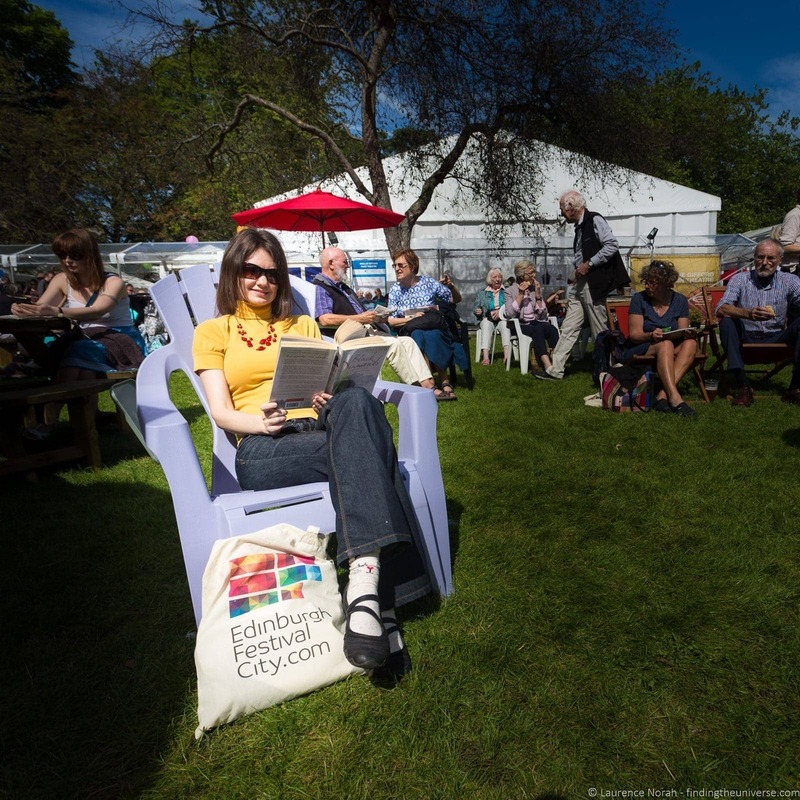 With over 750 events, focused in the beautiful Charlotte Square Gardens of Edinburgh’s New Town, this is a book lover’s paradise. There are book signings by authors, who range from the obscure to the world famous, debates, presentations, and of course, the opportunity to just pull up a chair and read the latest from your favourite author. This is one of our favourite chilled out festivals to just walk around, see all the books, and enjoy the sunshine in Charlotte Square gardens. Definitely one to pop into during your time in Edinburgh. 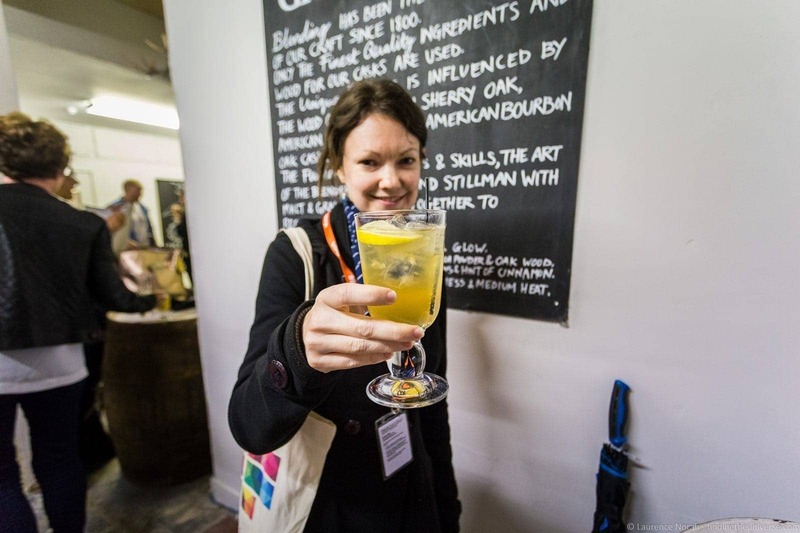 Having gone through the five major August festivals, I now want to go through just a few tips to help you get the most from your festivals experience in Edinburgh. First, and this should be quite obvious from the post, just remember that you don’t need to limit yourself to just one festival when you’re visiting Edinburgh during August! Many people focus on the Fringe, but there are five other festivals going on throughout the month, and I would definitely recommend taking the time to check out some of those during your visit. My next tip would be to plan for the weather to be, well, variable. Scotland is relatively far north, and whilst you do get sunny and warm days in August, these are by no means guaranteed, and temperatures can vary from 10C – 30C (50F – 86F). It can also rain pretty much anytime, and if you’re attending a night time performance of the Tattoo in particular, which is in a fairly exposed spot, you need to be prepared for most eventualities. My suggestion would be to dress in layers, carry a small umbrella or poncho, and just roll with whatever Scotland decides to throw at you. My third tip would be to leave yourself plenty of time to get from venue to venue. Central Edinburgh is very walkable, so getting around on foot is going to be your best option, but be aware that the crowds of people can make this process a little slower than you might otherwise imagine. If you’re looking for a specific kind of hotel or room type, then you definitely need to book as far in advance as possible, because rooms sell out a long time in advance for the August festival season. If you’re more flexible, then you will have more choice, but you definitely need to plan in advance nonetheless. The good news is that there are plenty of options for accommodation in August. 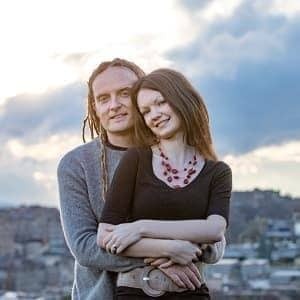 A good many of Edinburgh’s residents actually leave the city, and put their properties up on sites like AirBnB (up to $100 off your trip if you sign up for AirBnB with this link!) for the month. That’s one excellent way to find accommodation. If you’re not having luck with AirBnB, then check out my guide to AirBnB alternatives. Another idea is to get a place a little outside the city centre. There are a number of satellite towns around Edinburgh with a 30 – 45 minutes public transport connection, where you might find better value options. The public transport network in Edinburgh is excellent, and night buses often run into the early hours, so that is definitely an option if you’re looking to save money and don’t mind a bit of a “commute”. Our favourite way to find the best deals on accommodation is with Booking.com. In our experience, they have the best range of properties and the most competitive prices. Check out their listings for Edinburgh here. If you prefer an apartment, then as mentioned above, we definitely recommend AirBnB. We’ve tried all the others, and AirBnB consistently has the most options for locations around the world. Plus, if you’ve never used them before, you’ll get up to a $100 discount if you sign up with this link. (Discount varies by currency and if you choose to host at some point). Just make sure that you plan in advance, and prepare to pay more than you normally would for the August period. 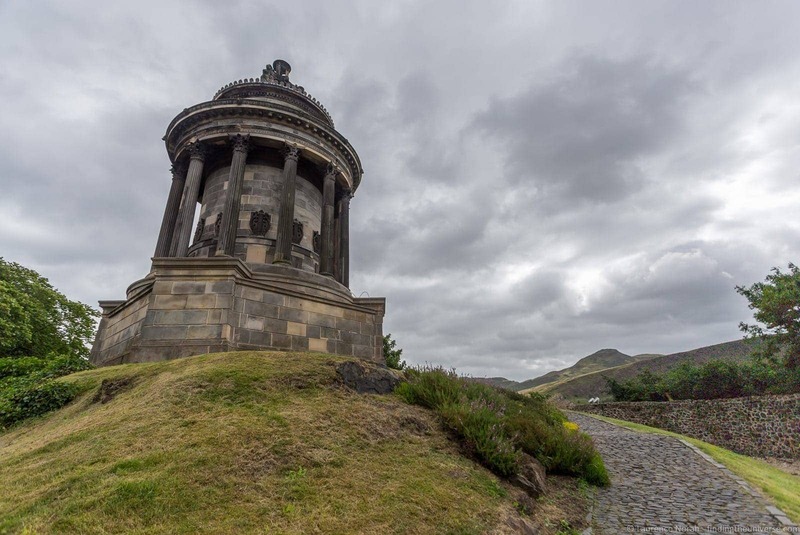 Looking for more inspiration to help you get the most out of your trip to Edinburgh? Here are some posts and other reading material that you might find useful! And that just about sums up our guide to Edinburgh’s August Festivals! Which of these festivals would you most like to visit, and which had you heard of? Let us know in the comments below!